Baking good bread is an art very few master to perfection. Today's bread has the goodness of wheat bran and green olives. It's full of fiber as well as anti-oxidants to make your breakfast, a healthy one. Although, one can also use black olives for this recipe, using semi-dried green olives will give you the best results. Since this bread contains green olives, you cannot keep it for a longer period. I generally make it on the weekends in limited quantity so that it can be consumed on the very same day. You can also shred the olives into much smaller pieces to let them evenly and densely spread within the dough. There's no harm adding a bit of cashew nut or almond pieces within this nutritious bread. 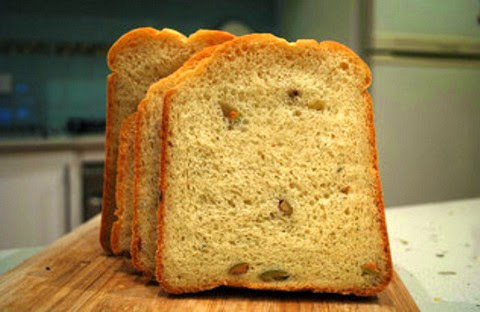 Do make this unique and nutritious bread recipe which includes green olive chunks and is baked delicately with an amazing pungency and delightful flavor. Take a large tray and add wheat flour and wheat bran in it. Sift it well with your hands for about 2 minutes. Add green olives, yeast, baking powder, clarified butter, sugar and salt in it. Slowly add lukewarm water and knead it into soft bread dough. Cover with muslin cloth and keep aside for one hour. Take a baking tray and grease it with clarified butter. Make two or three loafs from the dough and place carefully in the greased tray. Bake in a preheated oven at 200 degrees for 20 minutes. Once check with a needle or fork whether it is done or not. Slice in your desired shape and serve at room temperature.